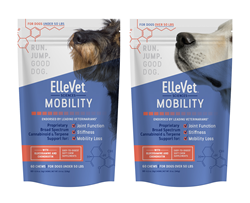 ElleVet Sciences announced the launch of “ElleVet Mobility,” a supplement made from a proprietary hemp oil blend designed to support joint function and mobility in older dogs. ElleVet Sciences announced the launch of “ElleVet Mobility,” a supplement made from a proprietary hemp oil blend designed to support joint function and mobility in older dogs. The supplement comes in a soft chew form with added glucosamine and chondroitin, and is available in two versions sized for dogs over and under fifty pounds. The easy-to-digest products were moved into production for sale through veterinarian offices and online only after thorough testing was performed at one of the nation’s top veterinary colleges. ElleVet partnered with Cornell University College of Veterinary Medicine to conduct the first pharmacokinetic study and clinical trial on the use of cannabinoids in dogs with osteoarthritis, using ElleVet’s proprietary hemp oil blend. Ellevet was the first to do a PK study and test the impact of cannabinoids on dogs with osteoarthritis. The results of the study brought unprecedented support for a hemp oil supplement for dogs from the veterinarians who administered the study. They referenced ElleVet’s product as “…a game changer that could change the face of veterinary medicine.” That sentiment from peer professionals has been echoed by the dog owners whose pets used the product in the study and in subsequent trials. The ElleVet Sciences team shares some of the comments they’ve heard from the people whose pets have enjoyed a return to the more active lifestyles ElleVet Mobility was designed to support. “‘My dog hasn’t gone up the stairs in four years” was the way one owner described the change in their pet’s behavior. Another dog owner echoed that sentiment when they shared that “My dog is re-engaged with the family and is playing again, things that we thought had stopped because of age.’” The impact of those real-world reports combined with the success of the Cornell study galvanized ElleVet Science’s efforts to continue to uphold the empirical standards they’ve set for the products they produce. They’re working to continue the scientific due diligence they’ve performed in the past with studies currently in the works in the areas of oncology and postoperative support as well as behavioral and anxiety support. “ElleVet Behavioral” is already in the pipeline and is set for launch soon to support dogs with separation issues, nervous habits, and destructive behaviors. Its development is following the same path of scientific scrutiny that achieved such dramatic results for ElleVet Mobility. ElleVet's owners are inspired every day by the success and science behind their product performance, the joy and well being they bring to pets and pet owners, and their passion for animals. Founded in 2017 in Portland, Maine, ElleVet Sciences provides support for dog owners with soft-chew supplements made from its proprietary hemp oil blends. That signature active ingredient was the subject of the first pharmacokinetic study and clinical trial on the use of cannabinoids in dogs with osteoarthritis. The enthusiastic endorsement from the vets who administered that study at the Cornell University College of Veterinary Medicine represents the new scientific standard for this class of products that ElleVet Sciences pledges to maintain. Learn more and purchase products at ellevetsciences.com.